a lot of you knew my project the minute it showed up. this tutorial will give you the basics on how to create your "snow" ruffle. 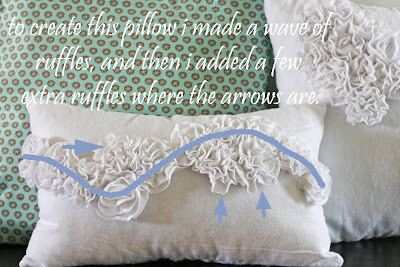 here are the steps i used to create my ruffles. first cut strips that will be your ruffles. for this project i used flannel. you will end up with two strips at 21 to 23 inches each by 1 inch. sew all the way down and make sure you leave some thread at the ends. take the end strings and lightly pull ONE thread , this will gather your fabric. if you pull too quickly or tug too hard on it, it might break the thread. you should end up with your fabric looking like this. do this to as many ruffled flowers you would like to have. next to create the ruffled flower, start by taking one end and wrapping around it like so. next you are going to hand sew your flower. with a needle you will go through from one side to the other, and back again. like the picture shown above. once you secure a few layers together, wind some more fabric around and continue the process of sewing through and securing a few layers at a time. your flower should stay formed once you are done winding all the fabric around, finish off your flower by tying a knot. once your flower has been formed, you will want to secure it to your pillow top. this can be any size you desire. mine was roughly 14 by 10 inches for the small one and 15 by 15 inches for the large square one. to secure your ruffled flower i started in the middle of each flower and hand sewed each one of them on, in the desired spot i wanted. once you have the design done and sewn on your pillow top. cut out the same size and shape for the back. with right sides together, sew all four sides using a 1/4 inch seam allowance, leaving a hole at the bottom of your pillow. pull inside out, stuff with poly fill and hand stitch closed. here's what i did to create the "snow drift" if you will. make a wave and add a few extra flowers where the arrows are. I'm so happy you won. I love this pillow!! I love this pillow! It is gorgeous and I just might give it a try myself. You threw me for a minute by using a different model- tricky tricky!- but I think the scarf is yours. It's very pretty and I would have picked it anyway even if I didn't think it was yours. I like the little mitten stamps too. Oh, and I know I probably won't win that pillow, but it rocks! Thyanks for the tutorial! That's awesome! I LOVE this pillow. I can't wait to try it out! AWESOME. see, i told you were genius. cheers to you v! It is a very pretty pillow! I may attempt it later in purple! Wow -- that is so beautiful! Very classy! You are so creative and talented! Thanks for the tutorial. I have been looking for a pillow for my couch. Think I found it! I have WAY too many pillows around here (plus a couple more on my to do list. I think this one shot to the top though when I saw it. I'm headed over right now to SYTYC to see whats up this week. Thanks for all the inspiration! that is a very beautiful pillow, Love it! thanks for the tutorial, Merry Christmas to you. Ya, I knew it was yours too! And of course it's gorgeous! Awesome! Congrats on the win. Love the pillow. Can you overnight some of your crafty-creativeness to me? I could sure use some to finish up a few Christmas projects. I love that pillow..so pretty! Such a cute and unique pillow! Vanessa I am so happy for you! I thought for sure this pillow was yours! I love it and hope to make one for my house soon! Merry Christmas!! i knew it was you! so, so pretty and soft. lol. i am sitting here scrolling through your blog... sighing that i was too busy to enter that contest (roman holiday!!! darn! ), and oooohing and ahhhhhing over this pillow!!! I am on my way to look at the tutorial, and am so thankful to learn to make this! thank you. merry christmas! I loved this pillow! Knew it had to be yours and voted anyway - ;) hehee It's awesome! So happy that your tutorial won! That pillow is just gorgeous. Definitely on my to do list! Beautiful pillow. Congrats!!! Thanks for sharing the tutorial. I can't get enough of your tutorials! They are all so creative and great! I'd like to share a link to this tutorial on sewwhattoday.blogspot.com on January 20! Love this! Om MY! How cute is that pillow!!! I love it in white! Perfect creation! Wonderful tutorial! Coming back to hang my hat for awhile! Ta Ta for now! I have got to try and make this pillow. I just posted on my blog a pillow that I am currently working on and it needs something. Now I know what. Thanks for showing us how. I'm going to try this. It's so pretty. Winter always makes me want to sit on the couch and sew!! Oh my, I'm a complete sucker for ruffles. I HAVE to make that!!! Just wanted to letcha know I loved your idea and I linked to this post in my blog! oh how cute. I know my 3 GD's will love the pillow. thanks. oh, wow, I love this! I hope you don't mind I linked a post about this on my blog! I am going to sew this...NOW. so cute. I just wanted to let you know I have linked to this project and thumbnail and a few of your other projects on our site. I think they're great projects that our readers will love to make! We are always looking for more tutorials and sewing patterns, so if you have any similar projects please feel free to send them my way or let me know if you prefer we not link to you. Thanks! 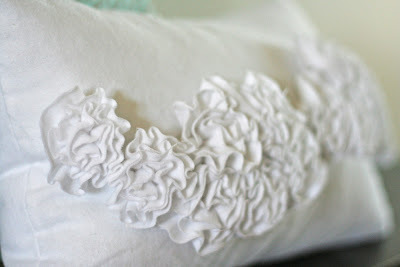 I really like this ruffle pillow, there is nothing better than having a good sleep at night, and I have to admit this is so wonderful to have one at home. Superb tutorial, lovely pillow !!! 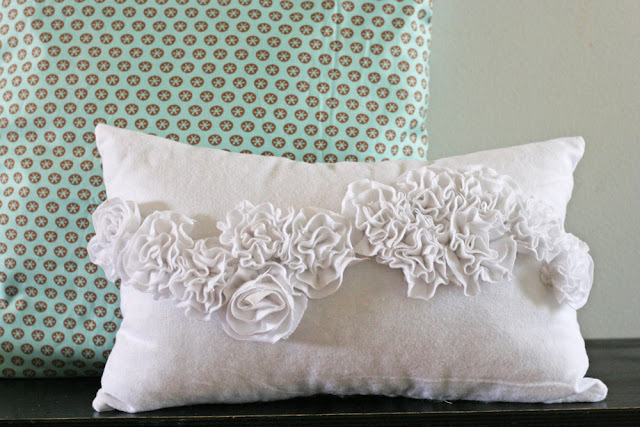 I love this tutorial, I'm going to try and make them for my couch :). I love all of your tutorials, very cute things! thank you!